This is another photo from my cousin Erin O’Donnell. From the style of her dress I would estimate that the date of this pictures is in the late 1890’s. Bridget would have been about thirty to thirty five at that time. To me she appears to be pregnant. I am thinking that the children in the photo are top left to right, Catherine born 1893, Thomas born 1891 or John born 1896, Norah born1896 and Mary born 1898. If she were pregnant that would be her son Richard born 1900. My grandfather Thomas would have been about eight at the time the photo was taken and John would have been three to four. I think it is Thomas my grandfather. Mary looks like she is about to escape. Erin told me that the Dowd’s did not take very many pictures, I am glad that trait escaped me. 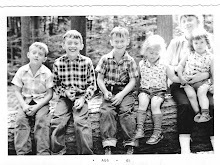 My dad circa 1959, with me, my mother and brother. He must have said something funny to get us to look at him. My grandfather and my father circa 1918. My great grandmother, grandmother and great grandfather, circa 1910. My great grandparents (Schridde) circa 1890? Is it Bridget and Catherine or Catherine and Bridget? After a long time searching I have found a picture of my great grandmother and her twin sister. My father was correct when he said he could not tell them apart. Bridget is my great grandmother and I had heard rumor of a twin but I discovered the rumor was true a few months ago. The only great grandparent I need a picture of now is Bridget’s husband Thomas Dowd. Picture from the collection of my newly found cousin Erin O’Donnell, Bridget was her great grandmother too. Thank you Erin.